Located in Southern Oregon, Crater Lake National Park is home to the deepest lake in the United States and the ninth deepest lake in the world. We visited Crater Lake in September as part of a ten day trip to Oregon and Northern CA, and we were blessed with perfect weather. 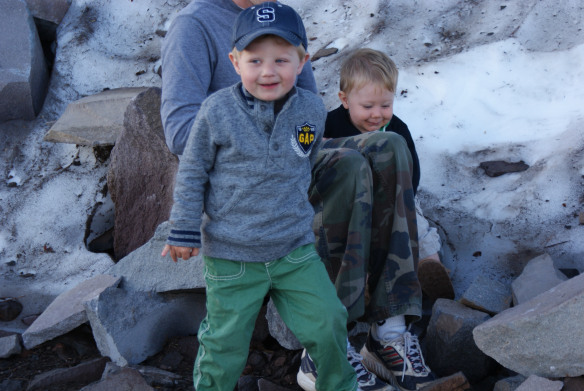 We were prepared for very cold temperatures and even dragged along winter coats for our boys since the park often gets its first snowfall in September, and the forecast before we left promised temperatures in the thirties and forties. In fact, when we arrived, I wouldn’t let the boys out of the car until I wrestled them into their jackets and hats. Upon opening the car door, I realized what a complete waste of energy that wrestling match was since I was comfortable in shorts and a sweater. Pictures, especially ours, cannot possibly do Crater Lake justice. This is one of those places that you have to see in person to fully appreciate. The lake is the most amazing deep blue color and it’s so clear. The lake was formed when a volcano erupted about 7,700 years ago and the sides of the volcano collapsed and formed the caldera. Over the years, the caldera filled with snowfall, which is the reason the lake is so clear. This image is courtesy of the National Park Service. 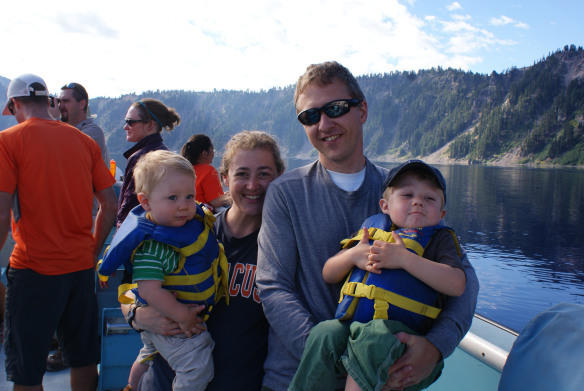 The best way to see the lake is by taking the boat tour that the National Park Service offers. However, just like most worthwhile things in life, you really have to earn this boat ride. 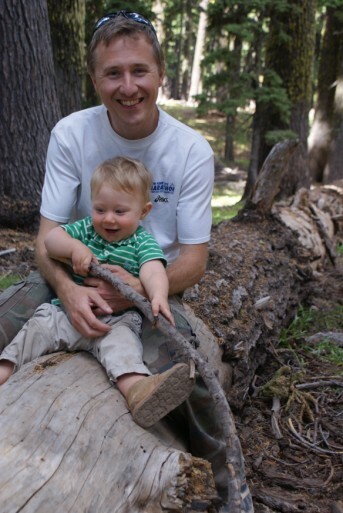 The only way to reach the lake is to hike the Cleetwood Cove Trail, which drops 700 feet in elevation over 1.1 miles. The walk down is obviously very easy and our three year old, Finnegan, happily walked and ran the entire way. The hike back up was another story. Finnegan walked less than 50 feet before insisting that we carry him the rest of the way. Here’s my favorite picture from our visit. 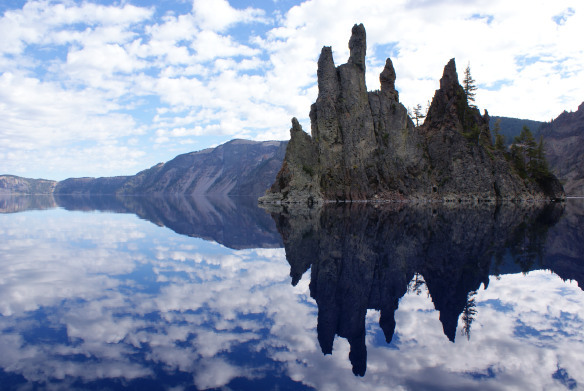 This is Phantom Ship, an island in Crater Lake, and it’s so picturesque that it’s hard to take a bad picture. We also stayed in our first National Park lodge on this trip. 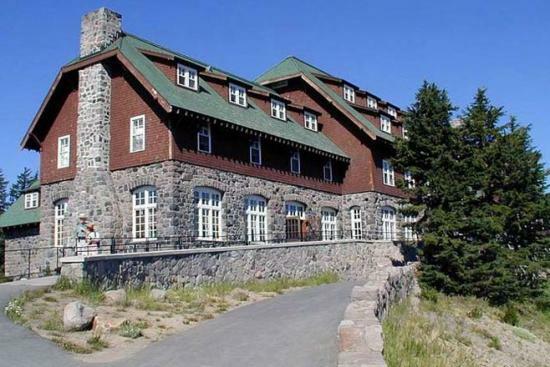 Crater Lake Lodge is located right on the edge of the lake so the views are impressive and you feel like you have the park to yourself in the morning. The rooms are simple, but comfortable and the lobby is impressive in a rustic way. We were glad that we spent the night and had a little more time to explore the park. We even found some snow from the previous winter for the boys to play in! 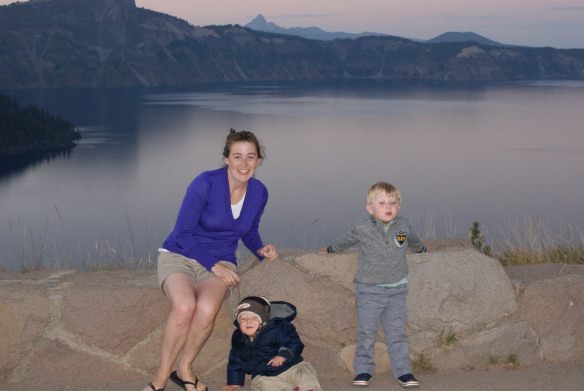 We were really happy that we made the detour to visit Crater Lake National Park as part of our trip to the Oregon Coast and the Redwoods. It was well worth the extra hours in the car. 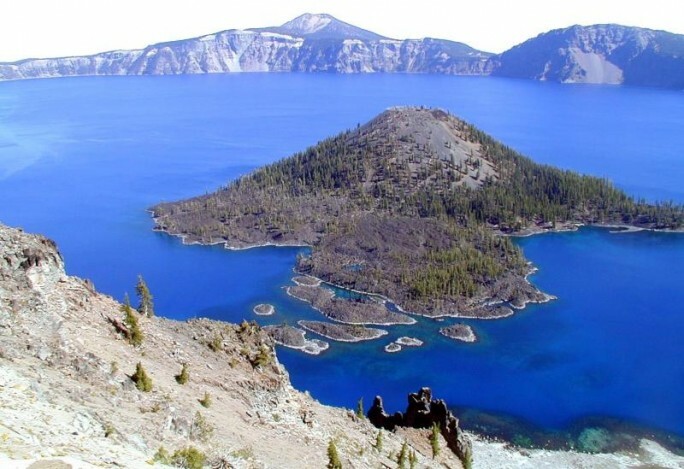 Have you visited Crater Lake National Park? If so, what were your highlights? 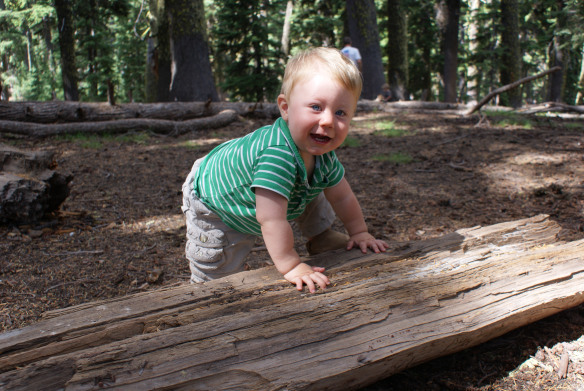 For more of our family travel adventures, visit us at Travels with Curley. Crater Lake was on my Bucket List from the moment I first heard about it, but it took me a long time to get there. I finally made it in June this year, on a similar trip to yours, by the sounds of it (driving down from Seattle to San Francisco, and finally Yosemite, zigzagging back and forth between the coast and the mountains). We got to Bend, only to be told that the roads to Crater Lake might not be open yet, after the winter’s snow. Thankfully, after a nervous couple of hours, we discovered that while the East Rim road, was indeed closed, the West Rim was open. The view from the West Rim was jaw dropping, with thick snow blanketing the Crater edge. An absolutely magical way to see Crater Lake for the first time. Thanks for sharing the links to your blog! I love the photo that you posted of Crater Lake. It’s a really special place and not that easy to reach. We also worried about the weather, but it looks like we shared the same good luck!